I received a lovely e-mail this week from Paula, a woman I’ve known for some time online from the comments section at ChrisWeigant.com. I found out Paula is an Ohioan like me who has her own blog at Ec-Ohio – The Ohio-based Green Directory. She recently read my book and is currently searching for a publisher for her own. She follows SP 101 as well and had a few questions about self-publishing. One of the standard WP widgets is the “Subscribe” widget, where people can sign-up to be notified when you put up a new post. I would happily subscribe to that. Any reason why you didn’t implement it? Yes, indeed, I wrote her back. The reason I didn’t implement it was simply because I’m relatively new to book selling and promotion and didn’t know about it. I’m almost ashamed to admit it. So I beat myself up for a couple minutes then went online and started looking for how to do it. It wasn’t long before I came upon the Email Subscribers plugin. 10 minutes later, I had it up on my website (highlighted in red). Because of Paula’s excellent feedback, I thought how to sell books from your blog would make a good topic for this week. Second, I’m going to assume that you have some basic familiarity with WordPress. I’m going to assume that you know about themes and plugins and widgets. If you’re not familiar with WordPress, you may want to start here. Getting a basic website up and learning how to customize it is not hard. One of the most amazing things about WordPress is the number of themes available. Themes are templates built by people for specific uses and/or designs. 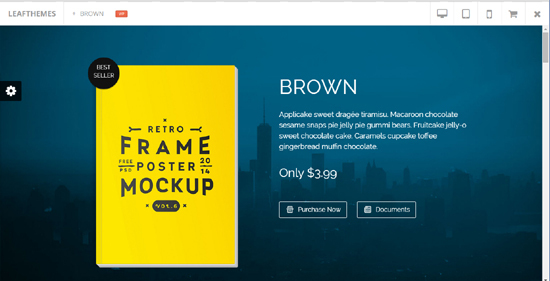 They are usually available for purchase for $30-$100 per theme. When it comes to selling books on your site, there are a couple of different approaches. The first is to simply build a site that is a landing page for the book. This site is basically an advertisement for the book. It will feature your book, how to buy your book, a little about you as the author, some samples, some comments, etc. It is completely designed around the book. A good example theme for a landing page is Brown (good theme, terrible name … heheh). Landing page website are good when you know you’re going to have traffic. You market in other ways and point people to the site. The issue with landing page sites is that they don’t support blogging. So I’m not going to talk any more about them here. If you want your blog and book sites to be the same site, some good themes that allow you to do this include Bookish, Publisher, and Ebook. The best reason for doing this is that if you feature good content and have built an audience, your blog will attract traffic to your website (where you can then showoff your book(s)). Here’s a few quick notes on the features of these three themes. You can test out Bookish here. You can test out Publisher here. 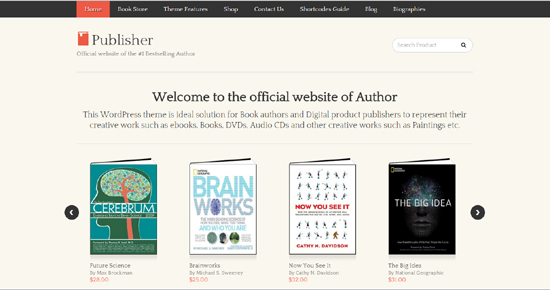 The Ebook theme is very similar to a landing page with blog capabilities. I found this theme to be very compelling and if I ever decided to do a re-design, this is likely the theme I’d try. You can test out Ebook here. So why did I start with themes and recommend themes if I didn’t use any of these themes? I started with themes because these have been developed by professional web designers and are great examples of the type of functionality and look/feel that you may want to include on your website. I originally built my website to blog. When I chose a theme, I chose one that I liked for blogging. I hired an artist to help me make it look good. 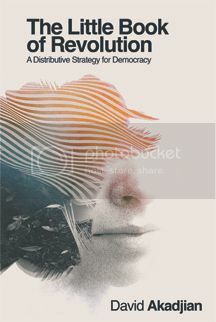 When I published my book, I was able to adapt it to show the book on the front page. In other words, to use it in some ways like a landing page. This worked for me for one book. However, it’s quite likely that in the future as I add more, I’m going to have to upgrade. This was the second reason I wanted to look at themes (Hey, I can get something out of this too, right?!). That said, the beauty of WordPress is that you can constantly add new functionality and even switch to entirely new themes very easily while still keeping all of your content intact. Plugins are a great way to add functionality to an existing theme. I already mentioned the E-mail Subscribers plugin. Here’s some of the plugins that have helped me add functionality and drive traffic to my website. Search Engine Optimization (SEO) is a whole topic in and of itself. I hope to write more about this in a future post. However, the WordPress SEO plugin can help you drive traffic without knowing a thing about Search Engine Optimization. When you write a post, WordPress SEO asks you for the focus keyword. 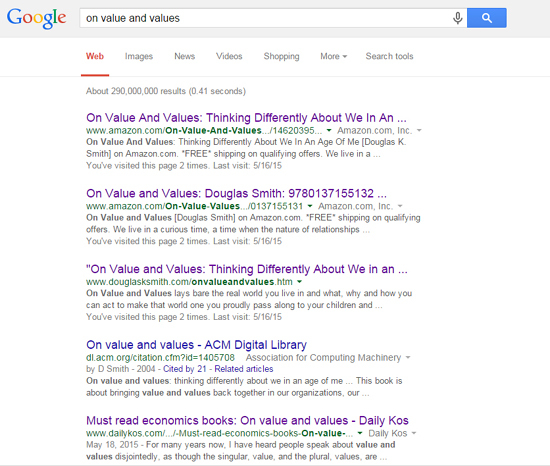 In the following example, mine was “on value and values,” the title of a book by Douglas K. Smith. Sure enough, out of 290 million possible hits, my article appears on the front page ranked 9th. In this picture, you can see the same article on Daily Kos beats it only slightly at #5 (Daily Kos gets a little more traffic than me 😉 ). If you have good content and do SEO well, you will get traffic. WordPress SEO helps you do this. If you only install one plugin, a good pick would be WordPress SEO. Akismet is the most popular comment spam filter on the web. Hugely popular and tremendously successful, this is a must have. The Subscribe / Connect / Follow Widget is a great plugin that creates a widget with follow buttons such as Facebook, Twitter, LinkedIn, RSS feeds, etc. Here’s what this looks like at the bottom of my website. 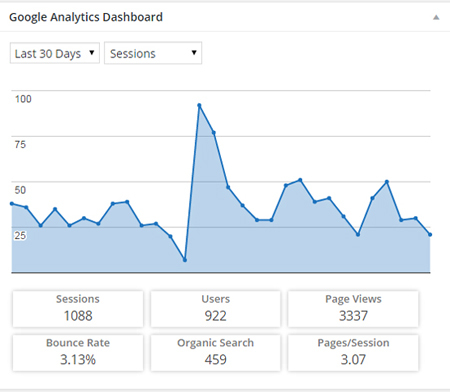 Google Analytics allows you to track traffic on your website. How many hits are you getting? Where are they coming from? What is popular? I’ll talk a little bit more about Google Analytics in a second. The Google Analytics Dashboard plugin provides a cool way to see your stats quickly from within WordPress. Otherwise, you have to login to Google Analytics. I haven’t installed the Disqus Comment System yet on my personal site but have installed it at others. It is tremendously powerful and a great add. It also helps avoid things like spam user registrations (yes, this happens!). This is likely a future install. The Twitter follow button isn’t a plugin. It’s a short piece of code that you can add to any HTML page that allows people to follow you easily on Twitter. You can get the code here. I added it to my author page. Google Analytics is a free service Google offers that allows you to track traffic on your website. To set this up, you need to first create a Google account here. Then, you need to copy a small piece of code to the header or footer at your website so Google can track it. The following 1-minute video shows you how to set this up. The information it provides is invaluable. 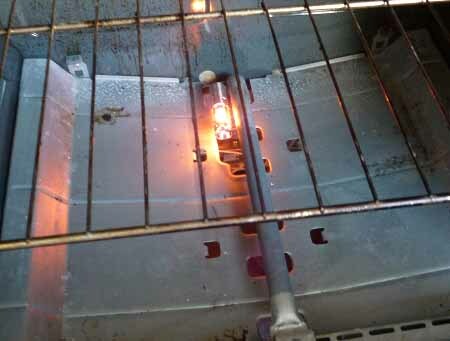 It helped me learn, for example, that one of my top traffic generators from Google keywords (to this day) is a post I wrote called How to Replace an Oven Igniter. Though the post was written in 2011, I still get 10-20 hits a month on this post. I suppose if writing books fails, I can always pursue a career in appliance repair! With WordPress and a $40 WordPress theme, however, I feel I’ve managed to create the website I want to be able to promote my book and writing. One of the hardest lessons over the years, in fact, has been keeping things simple. The temptation to add functionality is strong. Any time someone like Paula shows me something really cool, it’s very tempting to simply add it. The harder part is figuring out if adding it is too much. For example, when I added the subscribe feature, I actually decided to move my Facebook/Twitter follow buttons to the bottom so everything wouldn’t appear crowded on the screen. Based on user behavior, I prioritized the e-mail subscriber updates (I get most of my follows from other pages than my website). Learning these types of things takes practice, observation, and a cycle of updating periodically. It’s also why I’m really thankful for feedback from folks like Paula. How do you promote or sell your book on your website? What’s helped you the most? 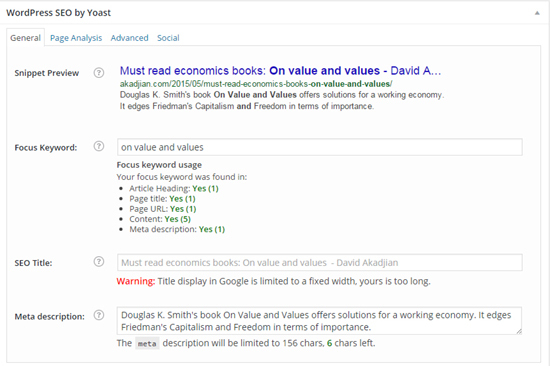 Or if you blog, what have you found useful? How do you drive traffic?